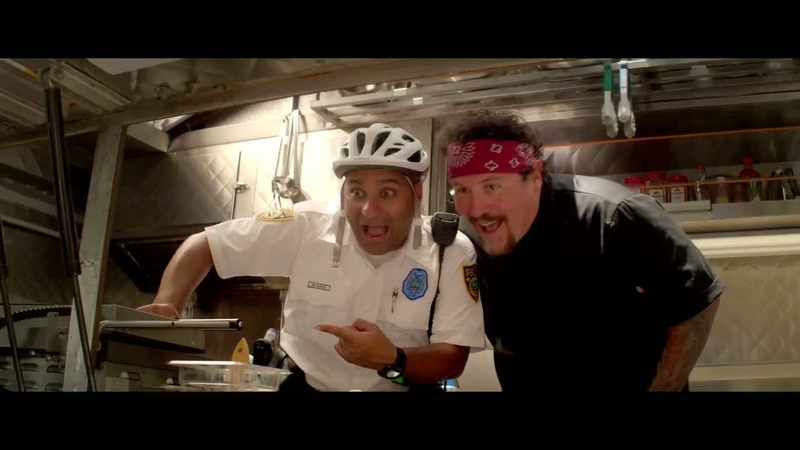 Okay, so Chef written and directed by Jon Favreau. Most people probably only remember him as the director of the Iron Man movies. And maybe some also know him as the driver/bodyguard to Tony Stark. For me I’ll always remember Jon Favreau as the irritated clown in an episode of ‘Seinfeld’ and in a recurring role as Monica’s boyfriend in ‘Friends’. So as an actor I don’t remember him doing much other than what i’ve mentioned above and as a director I only remember him working on the Iron Man movies. 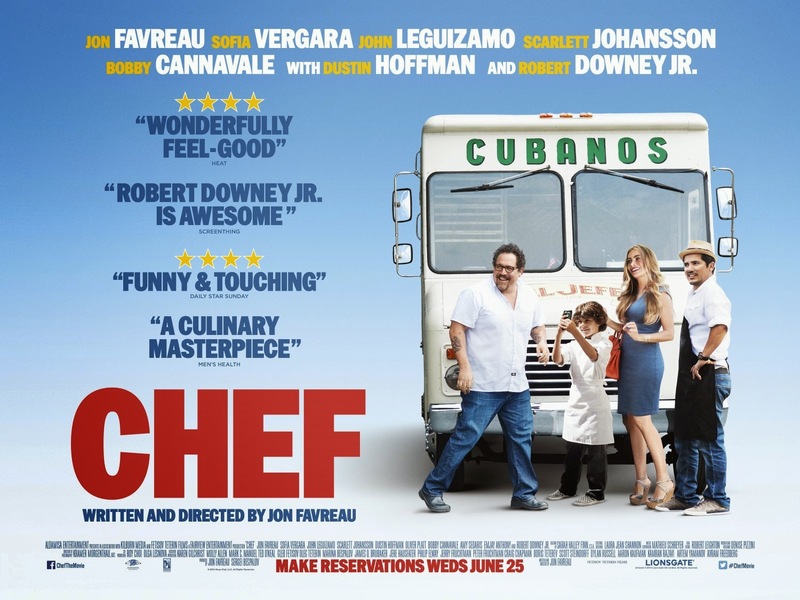 So Chef, for me, is a fresh look at Jon Favreau. So Chef, when it first started showing at the cinemas I did want to see it but for whatever reason I didn’t. I did pick up the buzz about the movie, that it was a good movie, that this is something different from the norm for Jon Favreau. But like I said I never got round to it. I’m glad I did. Why now? Well, if you’ve actually been visiting this pokey little blog you’ll notice that i wrote about what i thought about The Hundred-Foot Journey, and that I didn’t really think much of it. 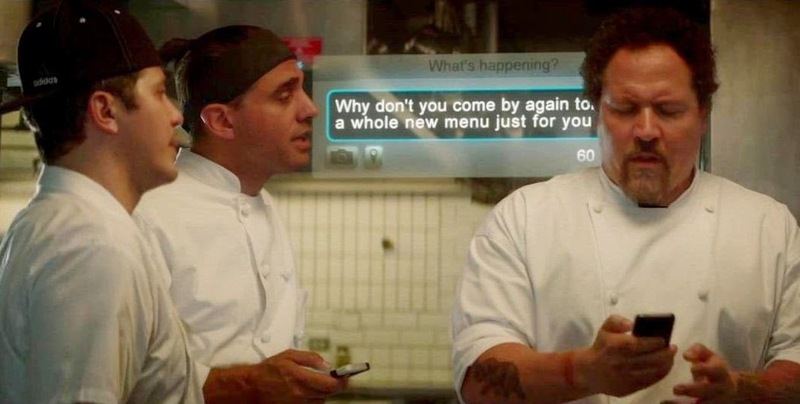 Which made me think about Chef, the other food related movie that’s out this year. Now, both movies have at it’s core food as it’s plot device. And of course the rags to riches theme and the self-discovery theme. You really can’t runaway from them it seems. But that’s where the similarities end. These two films are worlds apart. The Hundred-Foot Journey tries to seduce you with a fusion of the exotic asian spices and the quirky Kadams, the class and refinery of French culture and cuisine and tops it off with molecular gastronomy. Jon Favreau’s Chef doesn’t have that. It’s a lot simpler. It’s the difference between, well, a fine French Haute Cuisine dinner and a simple meal cooked at home by a really good cook. Nothing fancy here and it’s just as good if not better. Although in this case, between The Hundred-Foot Journey and Chef, I’d rather have a second helping of Chef. Jon Favreau. He’s good as Carl Casper. He’s believable as a chef. Heck, his healthy figure makes you think he is a chef and one who samples everything he makes. According to Wikipedia, Favreau wrote the script to Chef in about 2 weeks and that there are parallels between Casper’s life and Favreau’s. He even made comparison between Casper’s career and his own. So it’s safe to believe that in his performance he was literally drawing from his own memories and emotions that he’s had. And it shows. The other thing that shows up really well is the way he moves around the kitchen and the food truck. Again, according to Wikipedia, Favreau not only went to culinary school but worked in a restaurant following around Roy Choi who went from consulting on the film to becoming co-producer on it. Roy Choi is a celebrity in his own right apparently being one of the founders of the modern food truck movement. Now if you’re in the US you probably know about the modern food truck movement but for everyone else well it’s an interesting phenomenon that started a couple of years ago. Food trucks, from my casual read-up of it, are mobile kitchens that would set-up wherever they can and sell cheap and tasty food. Usually simple fair like burgers, tacos and the like. But around 2008 a new type of cuisine was showing up being sold out of these mobile kitchens. Fusion fair. Roy Choi, for instance sold a fusion of Korean and Mexican, tacos with grilled meat cooked in the Korean way. Not much later other food trucks started popping up offering unique menus featuring restaurant grade ingredients, like duck, foie gras, etc. The other thing that the modern food truck movement did was capitalize on social media, namely Twitter and Facebook. I caught a whiff of the phenomenon back then from way over here in Malaysia. I’d check out a few of the Twitter accounts of these food trucks, occasionally seeing them tweet where they’d be on that particular day and what the specials were. It was cool. Malaysia doesn’t really have a food truck culture. We’ve got too many road side stalls that sell cheap and good food, and they open all day and all night in some cases, but of late there have been a few that are trying out their luck with food trucks. So yeah, Favreau is good in this film. His dedication to learning the trade and skills as a chef and then a food truck operator comes through. The other thing that came through is his relationship with his son played by Emjay Anthony. They play off each other very well. The moments that shine through for me are when Carl speaks to his son about food, when his son schools him on social media and when they work together in the food truck. It’s good. Jon Leguizamo. I’ve always liked him. He has that charisma and energy that just comes through in everything he does. And it comes through here as he plays Carl’s sidekick when Carl gets his food truck. The many guest stars that show up in this movie. They’re only in a few scenes but they never steal it but make it work better. Dustin Hoffman as the restaurant owner who’s main focus is to make his restaurant successful. He’s got the formula down pat and he doesn’t want to risk things too much. Scarlett Johansson as the restaurant’s maître d'hôtel who is encouraging of Casper but has her loyalties torn between Casper and her boss. Robert Downey Jr. who plays the ex-husband of Sofia Vergara’s character, he’s quirky but I think it’s a bit too close to Tony Stark. The only guest cameo that showed up that I thought was pointless was Russell Peter’s. Not really necessary. The camera work is also excellent. Especially during the food preparation scenes before the food truck comes into play. It’s simple but beautiful. The music. I like what they’ve done with the music. It complements each scene beautifully. I had issues with the music in The Hundred-Foot Journey. I thoroughly enjoyed it in Chef. When Carl becomes aware of Twitter and is then taught how to use it by his son. And how he learns of how an innocent mistake can turn things around when they become viral. His dismay at not being able to do what he wants in his own kitchen. The scene between Favreau and Hoffman is good. His blow out at the restaurant when he confronts the food critic played by Oliver Platt. The rant is memorable. I can’t help but think that every chef that’s had a negative review in a blog or a magazine or a website has wanted to say what he says to that critic. The way the use of social media in this movie parallels what those founders of the modern food truck movement did when they first started and how current food trucks are using social media to their advantage. 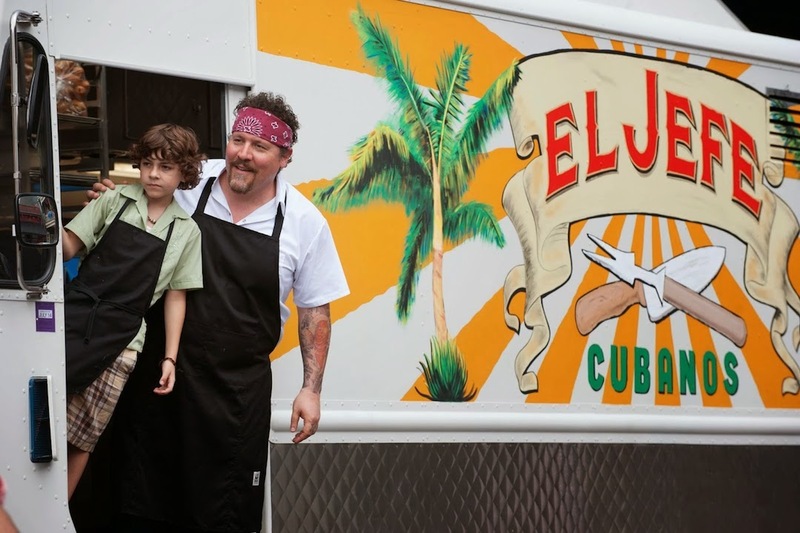 This movie is sort of an historical account of the rise of the food truck phenomena. The scene where Carl takes aside his son when he burns the sandwich. What he says in that scene was an incredibly honest and direct way of showing his passion for what he does to his son. All in all, if you haven’t figured it out yet, I like this movie. It’s good. A very satisfying one. A very surprising one. It’s surprising as The Secret Life of Walter Mitty was. Why? It’s sort of the same. With Mitty you have Ben Stiller. His past works haven’t been all that memorable. They were fun movies but for the most part nothing impressive but with Mitty, he did something different. Beautifully different. It’s the same with this. You know who Favreau is, you know what he’s done, but this is completely different from all of them. And as Mitty was for Stiller this was for Favreau. An unusual gem among all their other efforts. So go out there and find this movie and watch it. It’s well worth the effort and more so when you consider that this is from a man famous for making movies based on comics. He wrote it, directed it and stars in it and put a lot of himself in it and it shows. So out of 5 I give this a good 4. Also I think this is the worst review that I’ve written... It’s all over the place but I’m not bothered to fix it. Sort of like what you do with leftovers you find in the fridge. So don’t complain and just eat it. Also, I just had day-old pizza. I could use a good food truck right now.